There’s something special about being in the UK mountains at any time of year, but there’s something even more magical about winter walking when they’re transformed by the snow! 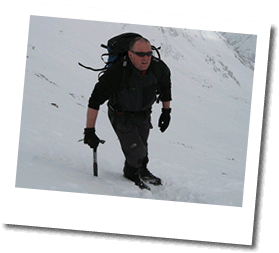 Winter conditions bring a number of additional hazards and, understandably, many people feel ill prepared to venture into this environment without the experience of a qualified instructor to show them the necessary skills to cope with them. The Scottish winter is certainly more reliable than in England and Wales and, to give us the best possible chance of good conditions, we tend to do most of our winter mountaineering north of the border as a result. Due to this being a very specialised activity, most bookings are done on a private arrangement basis. So, if you have a couple of like minded friends that fancy a walk on the wild side, give us a call and we’ll see what we can put together. There isn’t much opportunity for winter walking in our local area of Shropshire, se we find ourselves going wherever the snow is. The last few years have seen a good amount of snowfall in the Snowdonia National Park, but this tends not to be reliable year in year out. As a result, most of our courses head to Scotland. The Western Highlands of Lochaber and Glen Coe and the Cairngorm National Park are often favourites due to the famous mountains to be found in these areas and the relative ease of finding accommodation.